So I did this thing. This amazing, epic thing. I made a cake out of Krispy Kreme doughnuts. YES, PEOPLE. 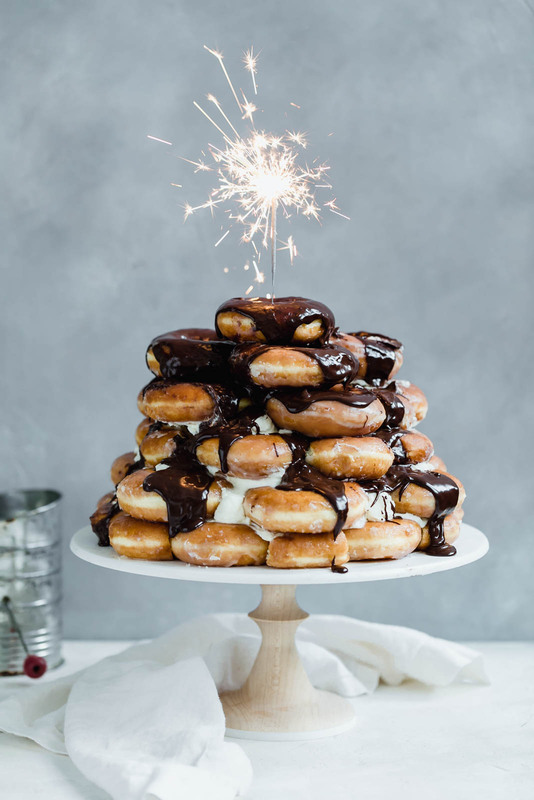 A KRISPY KREME-INSPIRED DOUGHNUT CAKE. 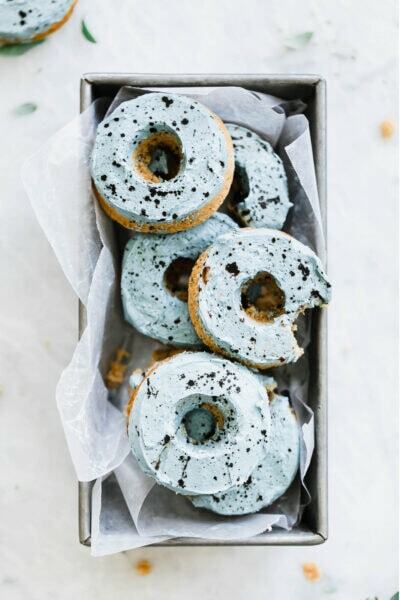 So I actually scoured the internet, and doughnut cakes aren’t really a thing… yet. There are doughnut walls, but not doughnut cakes. But let’s focus on the positive. This means that we can be the first and best Doughnut Cake makers out there. 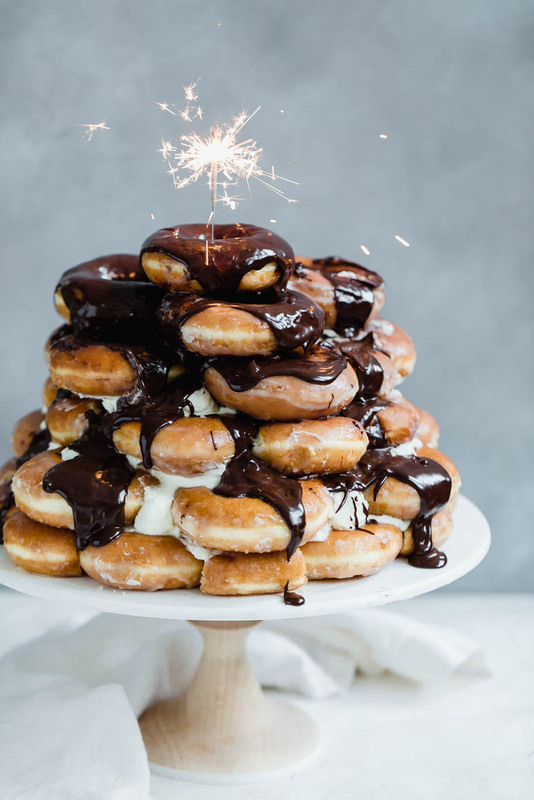 So let’s make Doughnut Cakes a thing in 2018. What is in a doughnut cake, you ask? How do you make one? 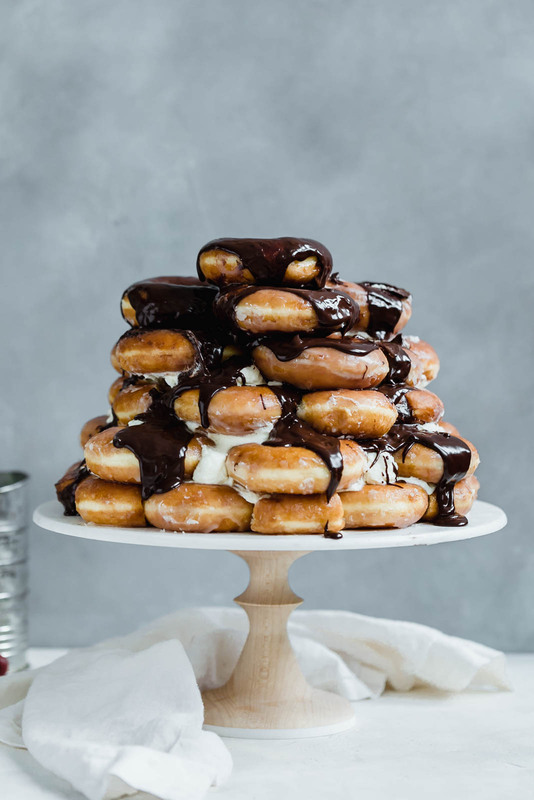 Well, you need three dozen Krispy Kreme Original Glazed® Doughnuts, a whole lotta whipped cream, and homemade chocolate fudge sauce. Sub traditional whipped cream for an eggnog whipped cream for a holiday-inspired cake. Sub fudge sauce for salted caramel for that salty/sweet combo everyone loves. Sub traditional Krispy Kreme yeasted doughnuts for Krispy Kreme Glazed Chocolate Cake Doughnuts for a chocolate explosion! This cake is incredibly easy to put together. No need to make your own doughnuts, Krispy Kreme Original Glazed Doughnuts are absolutely perfect for the job. They’re light, fluffy, and the perfect size to make into a six-layer doughnut cake. To ensure your cake stands nice and tall, you need to lay out the cake layers in a specific pattern. The bottom two layers use six doughnuts (one in the center and five circled around it). The next two layers up use just four doughnuts, and so on. Homemade whipped cream holds all the layers together, and the rich chocolate fudge sauce is poured on top to take this cake to the next level. And of course, in true Broma Bakery fashion, a sparkler on top is a perfect way to present a cake. I mean, just look at that glow. In a standing mixer with a whisk attachment, whip the cream and sugar until medium to stiff peaks form. 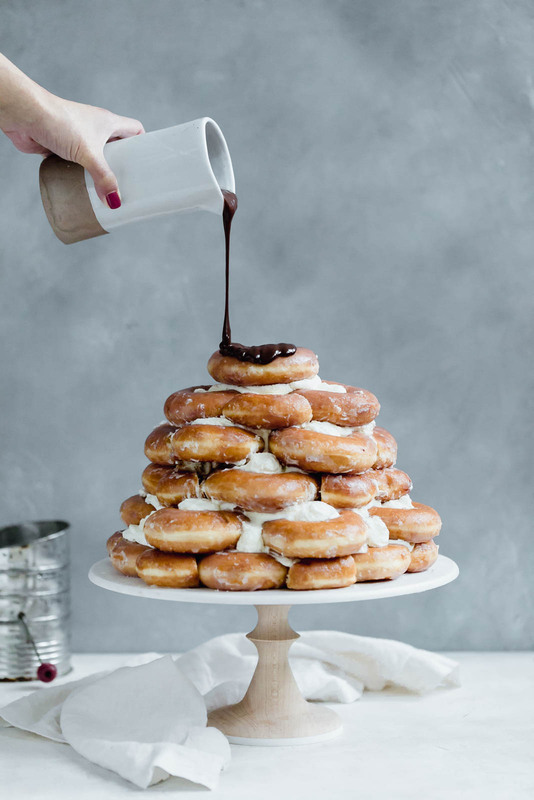 For layer one, spread a small dollop onto a large cake stand, then place one donut in the center. Place five doughnuts around it, creating your first layer. 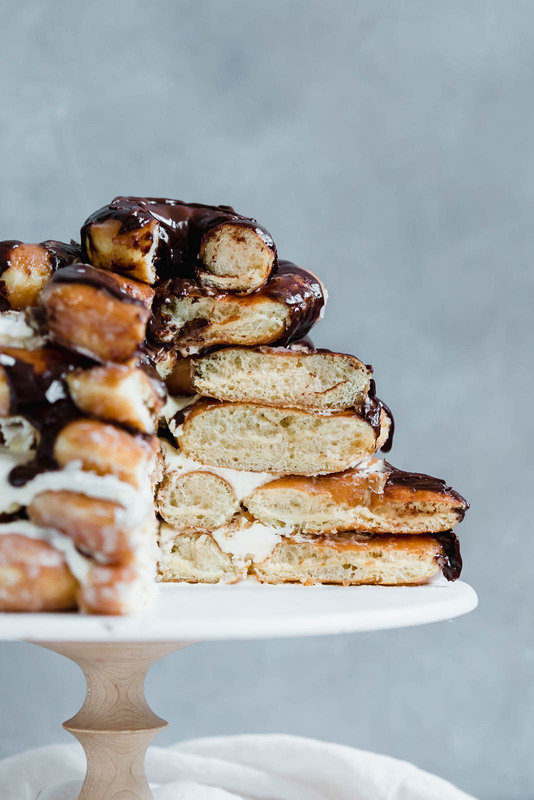 Spoon about 3/4 cup whipped cream over the doughnuts, then repeat the process for your second layer- one doughnut in the center, five doughnuts around it, and 3/4 cup whipped cream on top. For layers three and four, place four doughnuts onto the cake, creating a pyramid of sorts. Again, add 3/4 cup whipped cream in between the layers. For layer 5, place 3 doughnuts in a triangle, then add 1/4 cup whipped cream, just in the center. For layer 6, place a single doughnut on top! To make the fudge sauce, heat the heavy cream in a small saucepan until scalding. 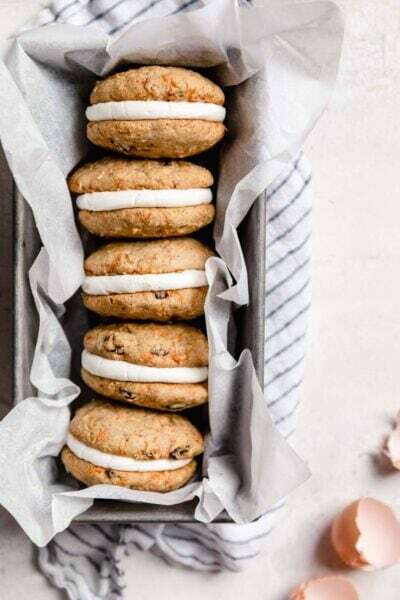 Remove from heat and add in chocolate chips. Stir until combined. Allow sauce to cool slightly before drizzling over the cake! This post is sponsored by Krispy Kreme. All text and opinions are 100% my own. Thank you for supporting the brands that help make Broma possible! PS. It’s calendar season. 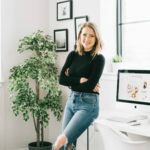 Looking for a calendar for your kitchen or office? How about a calendar filled with dooughnuts? 🙂 I got to check out Krispy Kreme’s new 2018 Wall Calendar and it’s filled with delicious recipe ideas developed around the Original Glazed Doughnuts. Plus, it has and lots fun coupons to use every month (click here to find a shop near you that has it). 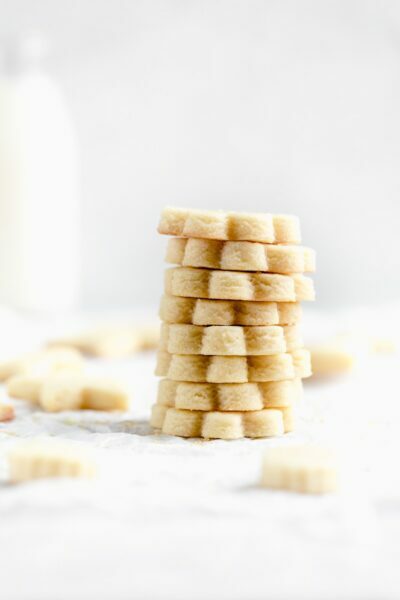 For more recipe inspiration, visit www.krispykreme.com/recipes. Oh, boy! This will be so much fun! Sarah, I keep all your recipes in a Sarah Recipe Book! Yes, an actual book… with all your amazing, yummy, creative perfect recipes ????! Thank you for another one! I LOVE this, Sarah! So creative, and also so insanely epic!! This is such an amazing idea for Hanukkah! This is so fun! Love this cake idea! My son’s next birthday cake!! Awe! This is so cute! Love it! How far in advance can I make this? As long as it’s within the day it should be fine right? This looks like theeeee most amazing birthday cake for my husband. He will die! Does it need to be refrigerated after it’s assembled? Will it keep for 24 hours? You can leave it out on the counter and it will definitely keep for 24 hours!